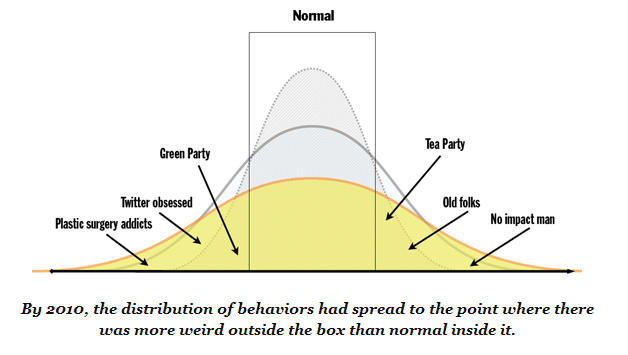 Many others are hopping on the weird wagon–“The Freaks Shall Inherit the Earth,” Chris Brogan recently proclaimed in a book of the same name. Brogan clarifies, “In the parlance of this book, a freak is someone obsessed with excellence and a deep understanding of their domain.” In other words, to be a great leader (or freak) is to be passionately weird. Those who are best at what they do are, among other things, weird. You should be too! Now is a great time to focus on your personas and create content that is special and just for them — after all creating something for everybody is actually creating something for nobody. C’mon, let’s shine some light on the weirdest examples on the web. Through a certain “je ne sais quoi,” these entertaining sites prove oddly engaging. When a brand puts out a truly unique game or activity site, their design dexterity, technical skill, and sense of fun have a stage on which to shine. Find inspiration in the fun sites of Hipopatum Studio, the Polish quirksters behind Bubole, a monster-building site. Wait! Don’t write Bubole off as a tired convention or Halloweeny gimmick. This endlessly interactive and rich design has much to teach about deep user engagement. Okay, Hipopatum is too good for just one mention. Their Neutrino 2011 puts you behind the wheel of a particle trying to travel faster than lightspeed. The whole thing looks hand drawn and plays like you are inside the head of a distracted 10th grader in physics class. There is not a lot of precedent for Record Tripping, from the Bell Brothers of South Jersey. What is at first a bizarre game (see: cats + DJing + Alice in Wonderland) becomes fun, and even addicting through its motley combination. The weird comes together for a truly interesting experience. Pablo is part of the WWF’s effort to save flamingos. It goes to show that well intended sites can have a fun, funky groove. Click and drag for the fun to begin–and pump up the volume to experience all the weird this site has to offer. Storytelling that hinges on the weird can put more on the line for users. If it’s uniquely intriguing or never-been-done, then I’m listening. Think about TV shows like Twin Peaks or MXC–both garnered cult followings for going where nobody had dared go. Parallax is utilized to tell the behind-the-scenes process of zombification. Education and gore take an interactive and entertaining twist in this comic book-esque narrative. Unusual, but awesome! This site tells the story of a game-making agency. Born out of “radioactive smelting accidents,” five mutant developers forged Mutant Labs. Watch the homepage video for the full effect. On this interactive feature from Exsus, clickable oddities abound. Expect a few bumps and delays when navigating–but, hey, what fun would a hiccup-free road trip be? Grab some snacks before you hit the road. This will keep you busy for a bit. Good portfolios set the designer apart before any samples are viewed. A great portfolio site conveys a designer’s approach to their work and can stand as a feat of creativity in itself. Add in some zany, and you have something genuinely awesome, like these sites. Begin navigating this portfolio site by blasting off on a rocket, a new realm of outer space for every page. When viewing the web design portfolio on the third level (stratosphere? ), a HAL 9000-like robot asks, “Do you like me?” Where are you taking me, Grzegorz? I love it. Here the point is less “What does Two Giraffes do, specifically?” than it is “What is the soul of this group?“ If that’s all you need to know, then it’s easy to cozy up to Two Giraffes’ offbeat sense of fun. Lausive’s site features an honesty anyone can appreciate. Sometimes ice cream’s just gonna drip on your ping pong paddle, and that’s okay. Krik, a Russian web design компания, has fun. If the zany work they have done doesn’t speak for itself, check out their subpages, like the team page. As Seth Godin puts it : “The core of your business is the weird; the people who care enough about your brand to choose you over anyone else.” Seth Godin’s line of thinking is as follows: the internet turns a new page in what it means to be a member of the public. Gone are the days of fitting in, and given the option not to occupy the hump of the marketing bell curve, more people are finally ready to step into their askance pants. Encouraged to “be themselves” as individualistic consumers, the market has likewise adapted. More than ever, marketeers today engage an idiosyncratic audience through sheer weird. Find inspiration in the peculiar, the out-of-bounds, the strange, and convey something entirely unique about your brand experience, game, or story. Let’s get weird. Not sure what you need? Try building an MVP. Click here to learn about Designing MVPs for Improved UX. Joe Concannon is a copywriter and blogger at Digital Telepathy. Besides spending quality time on the internet, he enjoys roaming the western half of this country in search of beer and hikes. Find him on Google+.